Hey guys. 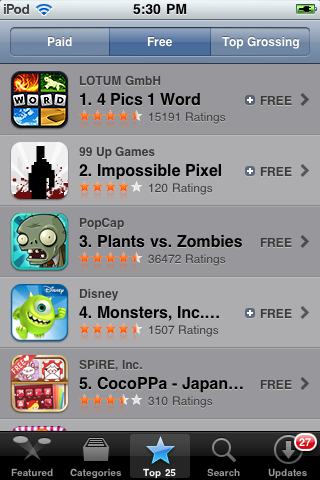 Wanted to point out a Stencyl game called Impossible Pixel that reached the #2 slot on the US App Store. This is an enormous accomplishment for the author as well as for us. How did it reach #2? There's more to this story than I have right now, but a contributing factor was a "sponsorship". Apps go through a strenuous and selective review process, and after the terms are worked out, they market the game on your behalf, snag reviews for it, etc. In effect, it's not unlike a Flash sponsorship in today's mobile-dominant world, except that a mobile sponsorship is significantly harder to obtain, and the terms are not as favorable upfront. But the payoff can be huge for you and your studio as we've seen here. That all said, the app was already doing pretty well before today and has actually been in the store for a couple months as a paid app. - Marketing makes the difference between a flop and a success. It's not sufficient to put your game up on the store. At a bare minimum, get a website for your "studio" or app, set up a Facebook page, post to some gamedev forums (like TouchArcade) and reach out to review sites. That's the minimum you can do. - Polish your game up and make it the best it can be. If your game isn't good, it's not going to stand out in an increasingly crowded and competitive environment. - A simple mechanic executed well is a safe bet. Lots of Meat Boy-inspired platformers are doing well because it's a well-understood mechanic but one with room for some creativity. - Don't overspend time on a game. If you're spending a year on a Stencyl-based game, you're taking too long. You'll learn more and potentially make more if you rapidly put things out, just so you get a hang of the whole process. I've seen examples of Stencyl games (for Flash) made in days/weeks, fully polished and raking in full-sized sponsorships. - Don't give up. It often takes several games before you get one that "succeeds." As long as you get better, work more efficiently and learn from your mistakes, your time will eventually come and payoff. Damn ! Ahead of Plants v.s Zombies and all that ! Now , that's an achievement ! Congrats to the team! I purchased a copy last week. but a contributing factor was a "sponsorship" with appgratis, a company that does something similar to FAAD and App Hero. Well done to the Impossible Pixel team! I wonder if they'd care to share how many installs they got during the promotion? In the developer's topic, he stated getting 600,000 installs in one day. As a comparison, an average, unpromoted free app can get just a few thousand installs over its lifetime. This developer was in the same boat too. Just to clarify everything. We did not spent any money to be featured by AppGratis and we didn't know the game was featured by AppGratis until they personally contacted us in the morning to inform us that the quality of the game decided them to put it live worldwide this day. AppGratis (of whom I'm not linked to) is an international company based in Paris, France. They are the leader app in their sector (free apps a day promos) and have around 9 million users, about 1/3 in France. The game has been downloaded more than 685 000 times (international Apple delays). Again, although I'm glad and proud of those, all of these downloads were free. So we're not rich at all yet and need to continue working on the game if we want to earn something ! I purchased a copy last week based on Jon's blog post here. I'm interested to understand more about the Appgratis feature - how could they just feature the game without your permission? Didn't you need to set the pricing to free? Thanks theabbott !! I'll make sure it goes directly into the upcoming making of Impossible Pixel 2 ! They asked my authorization just at the same time they put it up (around 9am in the morning) and we worked out a promo for the day. But they don't feature adds anywhere near their app or the game so for me it's a win/win situation. They told me that they have a drastic internal selection, I guess it's because they put their reputation on the line every time they feature something new. I'm happy that the hammer fell on Impossible Pixel ! I'll be happy to explain everything officially if you want to Jon ! Joe mentioned an interview with us about what happened and I'd be happy to do it (he has my professional mail) ! That's pretty cool. I don't have the app installed so I'm still scratching my head as to how they make their money? Differs from the other promo companies I've heard where they take an upfront fee from the dev. Give him an interview Jon! I bought your game a week or so ago, great fun. Very happy for you and the developer - this is important for Stencyl. This will hopefully act as motivation for me. i loved the game. it was amazing. the quality was so amazing, i thought you used a differnt program to use it. its pretty amazing that you made a game and was able to get it to the top charts in the Appstore! your a inspiration to me and i hope i end up eventually making it to the top charts like you. how long were you using Stencyl before you sent it out? whats it feel like being number 2 on Appstore? when will IP 2 come out?